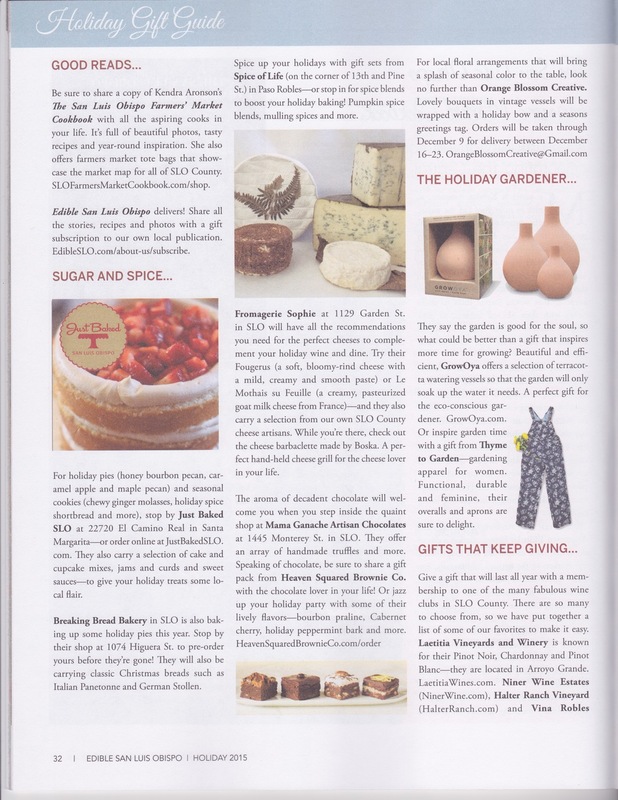 The Holidays 2015 issue of Edible SLO came out today! I had the privilege of writing about my inspiration behind the cookbook. In addition to my article, Edible SLO also gave a shout-out to my cookbook and my tote bags in their holiday gift guide! I'm really honored and flattered by their support. Please pick up a free copy around town! "Be sure to share a copy of Kendra Aronson's The San Luis Obispo Farmers' Market Cookbook with all the aspiring cooks in your life. It's full of beautiful photos, tasty recipes, and year-round inspiration. She also offers farmers' market tote bags that showcase the market map for all of SLO County." My name is Kendra Aronson, so nice to meet you! I'm the writer, photographer, designer, and self-publisher of The San Luis Obispo Farmers’ Market Cookbook: Simple Seasonal Recipes & Short Stories from the Central Coast of California. Three years ago, I embarked on this creative journey to create a community keepsake that would inspire folks to shake hands with their SLOcal farmers, to cook simple seasonal recipes, and to support restaurants that share the farm-to-table mission. Like any huge endeavor, it takes a village. In order to self-publish the cookbook, I ran a month-long campaign to raise funds for the up-front printing costs. $26,714 was raised on Kickstarter, an incredible crowdfunding platform that brings creative projects to life. This cookbook would not exist without these generous pledges and pre-order sales. I am truly blown away by the outpour of support—if you financially backed this campaign I can’t thank you enough for believing in my cookbook! With over 120 vendors each week, the downtown Thursday farmers’ market is one of the finest, most established, and longest-lasting markets in the nation. Additionally, San Luis Obispo County boasts 20 weekly farmers’ markets with hard-working folks committed to bringing only the freshest and most delicious produce, meats, fish, cheeses, breads, and more to County residents. This was the catalyst that compelled me to create a SLO farmers’ market cookbook that celebrates both the weekly bounty and the stories of these producers. As I frequented the other SLO city markets—the Saturday morning market off Dalidio Drive and the Tuesday afternoon market on Broad Street—I began to get to know the amazing people who provided such tasty, nourishing ingredients for my weekly seasonal meals. There was Julia Gomez of Julia’s Juices who sources her fruits and vegetables from her husband Javier’s farm, Red Barn Farm (formerly Suave Jave), and her cousin’s farm, Bautista Farms. Oftentimes the produce is picked early morning, juiced mid-morning, and sold at market that same afternoon or evening. You’d be hard-pressed (pun intended!) to find a fresher farm-to-glass juice operation anywhere. Then there was Philip Langston of SLO Grown Produce who grows the most beautiful, bright, juicy tomatoes year-round. As a Cal Poly Crop Science major in the 80s, Philip had dreams of working for NASA to grow plants in outer space—he was fascinated by seed germination in simulated weightlessness. He grows multiple varieties of tomatoes, eggplant, cucumber, and basil in his half-acre greenhouse. He is able to grow so much by scaling up vertically on vining tracks rather than horizontally in the ground, and by utilizing hydroponics as a method of growing his precious produce. It’s truly a sight to see! SLO County also hosts a huge array of world-class dining. The chefs that prepare these feasts rely on the freshest ingredients locally available to create their dishes. Multiple times a week I see Market Manager Matt Kubat whose full-time job is to buy for Robin’s Restaurant, Novo Restaurant and Lounge, and Luna Red. Crates upon crates brimming with freshly-picked produce are delivered to these three fine establishments on a daily basis—and sometimes twice a day to keep up with the demand of these high volume restaurants. Brandon Manuele of Sally Loo’s Wholesome Cafe and Brian Collins of Ember Restaurant are also frequent market shoppers seen sourcing the week’s harvest. It’s incredible to see all the dedication that goes into upholding a true farm-to-table mission. It’s stories of farmers, food artisans, and chefs like these that I want everyone to hear. My cookbook features 196 pages of 60 seasonal recipes, and 40 short stories about these fine folks that play a significant part in bringing food to our tables. The recipes are organized by seasons (15 recipes per season) and are sub-divided into five categories: breakfast, light bites, lunch, dinner, and dessert (3 recipes per category). In the spirit of collaboration, the majority of the recipes are provided by the food growers and chefs around SLO County to showcase the true taste of the Central Coast. To snag your copy (or multiple copies—they make great gifts!) for the holiday season visit www.slofarmersmarketcookbook.com this December 2015! THE SAN LUIS OBISPO FARMERS' MARKET COOKBOOK IS BACK IN STOCK! SLO FARMERS' MARKET COOKBOOK KICKSTARTER IS LIVE!